Donsol, Sorsogon about 540 kilometers from Manila. 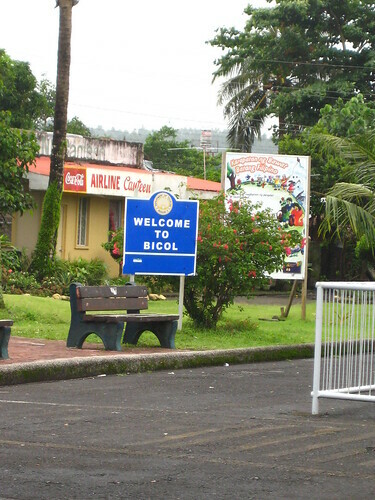 Like most provinces in the Bicol region, it can be reached by plane (via Legaspi) or by bus. Philippine Airlines flies daily to Legaspi. PR277 from Manila departs at 7:00 am, arriving in Legaspi at 8:05 am. The flight back to Manila, PR278 leaves Legaspi at 8:45 am, arriving at 9:50 am. Cebu Pacific has two flights to Legaspi. Flight 5J325 (M/W/F) departs Manila at 7:10 am, and arrives in Legaspi at 8:05 am. The flight back, 5J326 (M/W/F) leaves Legaspi at 8:35 am and gets to Manila by 9:30 am. Starting April 3, 2008, these two flights will be departing at a later time and will be operating daily (source: Cebu Pacific website). 5J325 will be flying daily, departing Manila at 8:25 am arriving 9:20 am. Likewise, 5J326 will also commence its daily flights, departing Legaspi at 9:50 am and arriving in Manila at 10:45 am. Flight 5J327 flies daily leaving Manila at 12:45 am, arriving in Legaspi at 1:40 pm. The flight back, 5J328 leaves at 2:10 pm, arriving in Manila at 3:05 pm. At the airport, you will be approached by people hawking private transfers to your resort. A van usually costs Php1,500 from Legaspi to Donsol. If you’re a big group, this is a good alternative. If you want to rough it, turn down the people offering you a van, and head out of the airport. There are always tricycles milling around. Ask the tricycle driver to take you to the transport terminal. The fare is Php50 since it’s a special trip. At the terminal, look for the van headed for Donsol (it’s clearly marked, don’t worry). The van wouldn’t leave until it’s full. If you’re one of the first there, you can tell the barker to reserve your seat while you get a bite to eat or to buy snacks to munch on during the ride. The van ride to Donsol is about an hour and a half from Legaspi, through a very long and very winding road going up and down the mountains. Don’t worry, the road is smoothly paved. The van fare is Php60, and will be collected by before you leave the terminal. When you reach the Donsol town proper, you can ask the van driver to drop you off at your resort for an additional fee. A fair amount would be Php20. To get to the airport from Donsol, ride the van from the Donsol town proper. The same cost applies, but there’s a longer wait for passengers headed for Legaspi. The route back to the Legaspi terminal passes through the airport, so if you’ve no plans of sight seeing in Legaspi, just ask your driver to drop you off at the airport. Several bus companies go to Legaspi and Sorsogon from Cubao or Pasay. Travel time from Manila to Legaspi is about 10 hours, and costs approximately Php650 one way. Philtranco has buses plying the Manila – Bicol route daily, with busses that go all the way to Donsol. Head on to Philtranco’s website for their schedule. From Donsol, you can go further south to Sorsogon or take the ferry going to Masbate from Pilar. If you’re headed for Cebu, you can try the Pilar – Masbate – Cebu route. From Donsol, make your way to the town of Pilar. There are daily boats going to Masbate leaving at 5:00 am, 8:00 am, 12:00 noon and 4:00 pm. Fare costs Php360 one-way. From Masbate, vessel M/V Asia Indonesia goes to Cebu every Tuesday, Thursday and Saturday at 6:00 pm. There are several classes in the boat: 2nd class (Php 480), Tourist Class (Php 883), Cabin (Php 1,390) and Presidential Suite (Php 1,719). All fares are per person and excludes taxes (about Php45). If I remember correctly, travel time from Donsol to Pilar is 30 minutes, Pilar to Masbate is 2 hours and Masbate to Cebu is 10 hours. This is an excellent, informative travel blog post! You make it sound easy… and inexpensive… to ramble around the Philippines! How does it work with luggage on the vans and the buses? I would imagine you need to pack fairly light to keep things manageable. None of that “two giant suitcases” American-style stuff! How much luggage, in addition to passengers, can a tricycle carry? I need to learn to travel light if I’m ever going to see these places. Er, how many luggage do you plan to bring?? Two passengers can fit inside the tricycle cab and another one can sit behind the driver. Some tricycle have luggage racks, so you can put your luggage there. Just pray it doesn’t fall off during the ride. I can’t really answer if a luggage would fit comfortably inside a tricycle. All of the travelers I saw inside the tricycle had those big backpacks. As for traveling light.. may I offer my packing list? No problem, Estan! Glad you found it useful. Most of the travelers in Donsol are plying that route, so they posted the information na at the resort. Hi Nina, a group of us are fly to Legaspi then go to Donsol, but then we make our way back to Manila with an overnight stop in Calaguas. I was wondering if you had any suggestions for the route from Legaspi/Donsol all the way to Paracale? Your blog is amazing, so informative and concise!! Hi Risa, I’m not so sure if there are jeeps or vans you can take from Donsol, but the route that I can think of is to either take Manila-bound bus (or at least one headed north) and getting off at Naga Daet or ride a van from Legaspi to Naga Daet. From Naga Daet, you need to take another van to Paracale. See if you can arrange for a van to take you from Donsol to Paracale, so it’s less hassle and time. Weigh the differences in the costs between your options, and the time it would take you to get from one place to another. Buses that go to Manila would usually only have a set departure time that might not work with your itinerary. Vans would always wait to fill up before it leaves. Hi Chel! Sorry, I don’t know what time the first van leaves Maybe 7-8am is a good approximation? hey rina hope this thread is still open..
do u think the fare is still the same after 2 years? The fare would probably be higher, but it shouldn’t be too much. Maybe about Php 100 higher, if ever. well better check it out myself.. haha.. I tried to book at A Whole New World Travel Express for Donsol package and it was very cheap for only PHP3500/pax for 3days2 nights with whaleshark interaction, and van transfer (manila-Donsol-Manila). is there bpi branch in pilar masbate?